Keri Oldham. Judith & Holofernes. 2016. Watercolor and graphite on paper. The Lazy Susan Gallery in collaboration with AS | Artists Studios, is proud to present BLOOD BANNER, a pop-up solo of work by artist Keri Oldham with an opening reception on Saturday, July 16th 6-8:30pm. The work in BLOOD BANNER combines images of demons and warriors with tragic figures and victorious ones. Inspired by the myth of the labyrinth as well as the short story, The Yellow Wallpaper, Oldham intersects two tales of demonology- the beasts that are external as well as the ones that reside within. 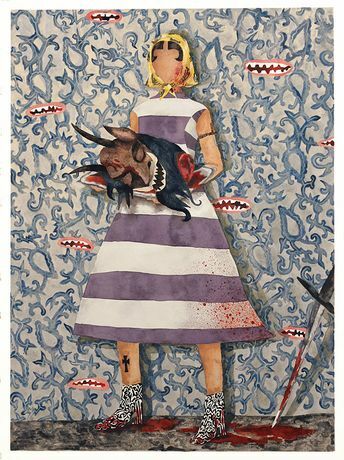 To allude to The Yellow Wallpaper, a hallucinatory tale that chronicles the progressive hysteria of a bed-bound 19th century woman, Oldham builds wallpaper design and pattern into her work, locking figures into maze-like and bloodied tableaus. Combing medieval demons with fashion and cinematic fantasy, these images are modern allegories for inner turmoil as well as women’s fight for success and identity in modern life. Keri Oldham is a Brooklyn-based artist working in watercolor and mixed media. Originally from Dallas, Texas, Oldham has exhibited her work throughout the country including; The Dallas Museum of Art and Kirk Hopper Fine Art in Dallas, as well as, The Whatcom Museum in Bellingham, Washington, Jen Bekman Gallery in New York, Honey Ramka Gallery in Brooklyn, Helmuth Projects San Diego, Guest Spot at The Reinstitute in Baltimore and One Mile Gallery in Kingston, New York. She was a 2011 Summer Central Track resident and has received awards including a 2010 New MediaFellowship with BRIC Arts in Brooklyn. This exhibition runs through Saturday, July 30th.